The traditional and the modern can coexist in the psyche of one person. Here’s a little quiz for you: when 20 Indian American physicians gather on a stage, do they A.) Lecture on pain management; B) Expound on AIDS research; C) Burst into semi classical Hindi songs, accompanied by a Karaoke machine? If you picked C – unlikely as it seems – you are right! Performers from the Chhandam School of Kathak Dance in San Fransisco. A group of ten couples, all doctors, have been gathering on a specially constructed stage at one of their homes in New Jersey, indulging in their passion for Indian music. The Karaoke machine stands in for the mandatory live orchestra as these physicians turn into semi-classical musicians for the night. Indeed, there are scores of physicians across the country who can recite ghazals at the drop of a hat, play the harmonium, dance the bharatanatyam or sing bhajans with fervor. But why stop at medical professionals? Whether it’s scientists, IT professionals, second generation kids, engineers, housewives or professors, they all seem to be either going for music or dance lessons, listening to ragas on their CD players or attending concerts. Indian immigrants may have brought over their innate spirituality and their passion for Bollywood with them, but growing up in India, no matter what their background, the love of dance and music came to them by sheer osmosis. 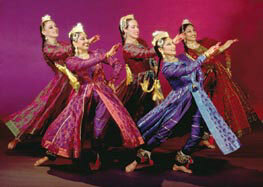 The Kruti School of Dance is among the largest in Atlanta. After all, Creation began when Shiva Nataraja, the Cosmic Dancer, danced the world into existence and the Primal Sound, encompassing the rhythms of creation, issued forth from his Damaru or drum. Rhythm and movement are everywhere in India, like air and water, and affect even the most prosaic shopkeeper in the bazaar or the academic in his ivory tower. For many Indian immigrants, their beloved music and dance had to be kept under wraps as they assimilated into a new world, their passion becoming almost a clandestine event, an underground operation shared only with like-minded friends. Now things, they are a changing. There are concerts of every kind of music from ghazals to Hindustani to Carnatic music in many major cities, and private music circles too. Over the past three decades, the number of schools for Indian performing arts, have proliferated. The Ali Akbar Khan school in California was founded in 1967. You can scarcely pick up an ethnic weekly without seeing advertisements for music, dance and even language schools across the country. Every other day you hear of yet another young bharatanatyam dancer performing her arangetram or initiation into dance. Lawyers and management consultants are routinely going in for tabla lessons or voice training. One of the oldest and noted dance companies in California is the Chitresh Das Dance Company (CDDC), created by the Kathak maestro Chitresh Das who received a Whitney scholarship in 1970 and taught at the Ali Akbar Khan School of Music before establishing his own school Chhandam in 1980. The school now has branches in San Francisco, Boston, Toronto and Calcutta. The San Francisco Bay area is a motherlode of cultural activity with scores of big and small music and dance companies, many gravitating to the area because of the energy generated by the Ali Akbar Khan School of Music. Well established dance gurus in the Bay Area include Katherine and K.P. Kunhiraman, who offer Bharatnatyam and Kathakali instruction through company Kalanjali Dances of India and Mythili Kumar of the Abhinaya Dance Company, as well as Pandit Chitresh Das. 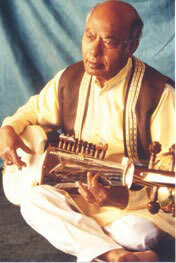 Master sarodist Ali Akbar Khan. New York and New Jersey, which for years had been quite barren of these kind of grass-root establishments, suddenly seem to be overflowing with them, with dance and music schools expanding in the suburbs too. In New York, Bharatanatyam dancer Swati Bhise has been teaching and performing for over 20 years and last year opened Sanskriti Institute for Indian Culture, holding classes at All Souls School on the Upper East Side of Manhattan. The school integrates the ethos of Indian dance, music, literature and philosophy. Similar action can be found in cities like Atlanta, Dallas, Chicago and Washington D.C., where Indians have settled in substantial numbers. Hundreds of concerts of dance and music, both Carnatic and Hindustani, are presented each year by some 90 -120 local organizers. These include noted museums like the Smithsonian, Asia Society and Lincoln Center, Hindu temples, universities and music societies. Some of the cultural organizations include The Music Circle in Los Angeles, World Music Institute and Bharati Vidya Bhavan in New York, Basant Bahar in San Jose, Calif., Ragamala in Seattle, Wash., and in Toronto, Canada. The Ali Akbar College of Music, which is the gold standard in teaching, also presents concerts in San Francisco. Ali Akbar Khan, the master sarodist, is considered a national living treasure in India and even in his 80’s continues to teach in the school he founded in 1967. 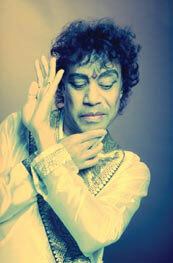 Zakir Hussain and his wife Antonia Minnecola are developing a performing arts school. He tours extensively and teaches also in Basel, Switzerland, at a branch of his school. Other performing institutions include Indian Music Society of Minnesota in Minneapolis, Minn., Kalakendra in Portland, Ore., Kalavati in Boston, Mass., and India Classical Music Society in Dallas, Texas. If you thought that this was it, there are many more names from Ohio to Florida, places where the dhols are being charged up and the sitar is making sweet music: East-West School of Music in Monroe, New York, Thyagaraja Aradhana Committee in Cleveland, Ohio, India Music Society in Milwaukee, Wisc., Sangeeta in St. Louis, Mo.,, Indian Music Society of Houston in Houston, and Sruti in Philadelphia, Penn. Among the organizations that have been sponsoring Carnatic musicians consistently is the Carnatic Music Association of North America (CMANA), founded in 1976. 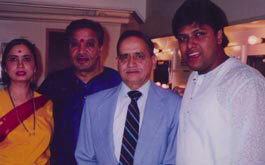 Others, such as Kalalaya in California and Bhairavi in Cleveland, Ohio, have also sponsored concert tours of many prominent Carnatic musicians. Tanushree Sarkar, who received her tutelage from Pandit Durga Lal of the Jaipur Gharana, has been teaching Kathak and vocal music at the Kathak Arts Center since 1976, first in Chicago and now in New Jersey. She says her many students include physicians and professionals, all avidly wanting to reconnect with their culture. And at the same time you have concerts by the big names like Ravi Shankar, Ali Akbar Khan and Zakir Hussain where huge audiences – both Western and Asian – are guaranteed for a performance. The collaborations of maestros like Ravi Shankar, Zakir Hussain, Vishwa Mohan Bhatt, L.Shankar, Vikku Vinayakram with Jon McGlaughlin and other Western musicians have further raised the visibility of Indian classical music. 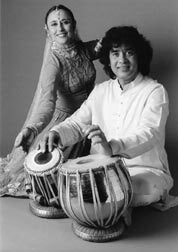 Zakir Hussain, who came to the United States in 1970 when he was just 18, first performed in concert with Ravi Shankar in New York. Between his many concerts, recordings, commissions (he is currently developing the music for Ismail Merchant’s Tina Turner starrer The Goddess and working with the chamber music ensemble, Kroner Quartet on an album dedicated to the music of R.D. Burman), he still finds time to teach a workshop every August. In the future, he and his wife Antonia Minnecola hope to establish a full-fledged center with classes and a small theater. Hariprasad Chaurasia and Subhankar Banerjee are among the legions of classical performers brought by Dr Balwant Dixit to America. So what is happening? Is it a full scale Renaissance, a revival of India’s great music and dance traditions? And why is it happening now? There’s a simple, one word answer – demographics. As the Indian American population has escalated to almost two million, the sheer numbers ensure an increased demand for such services, as immigrants, now well established, try to catch up on what they’ve missed and their American born children, who have come of age, hreflect on their roots. You have Indians everywhere, in major corporations, hospitals, and college campuses and of course, Silicon Valley. There’s wealth and a hunger to reconnect. She points out the generation, which came 30-40 years ago, pretty much wanted to blend in with the landscape and most of their cultural efforts were basement operations. Like the Irish and the Chinese before them, they tended to congregate in enclaves. Even though they had money and were educated, they did not build cultural institutions. Yet this verdant foliage of dance, music and culture didn’t spring up overnight. It was nurtured by a group of pioneers back in the 50’s and 60’s, stalwarts who introduced Indian culture to audiences in the west. The names of performers like Ali Akbar Khan, Ravi Shankar, Ustad Alla Rakha, Balasaraswati and Indrani Rahman are legendary and they exposed Americans to the best of classical Indian music and dance. Harihar Rao, 75, came to the United States in the early 1950’s and is the artistic director of the Music Circle, which was originally founded by Ravi Shankar, and is the oldest institution presenting Indian music to Westerners. Dr. Balwant N. Dixit, professor of pharmacology and coordinator of the Indian Classical Music Program at the University of Pittsburgh, has been responsible for bringing many of the noted performers to American campuses, and his story in America is linked intricately with that of Indian classical music here. Through the Center for the Performing Arts of India (CPAI), which he founded in collaboration with the University of Pennsylvania and the Indian Council for Cultural Relations, almost every major performer from Hariprasad Churasia to Vishwa Mohan Bhatt has showcased his talents and given workshops on American campuses. The CPAI is the only university based organization dedicated to promoting Indian classical music and does about 120 concerts a year across the country. Noted names like Ali Akbar Khan and Alla Rakha have stayed with Dixit, eaten meals cooked by him and his wife Vidya in a total labor of love, to bring classical Indian music to the mainstream. Now in his 70’s, Dixit continues to do this unpaid, largely unsung work. The young Indian Culture Club in Long Island, NY, conducts classes on classical and folk dance, music, languages, yoga and Vedic traditions at Herricks Middle School. A dedicated chronicler of the evolution of Indian music in the west, Dixit talked with Little India about the early days when violin virtuoso Yehudi Menuhin introduced Ali Akbar Khan and Ravi Shankar to Western audiences in the late 1950’s and George Harrison’s association with Ravi Shankar also caught the imagination of a young generation of Americans. Performances by Ravi Shankar and Alla Rakha in the Monterey Pop Festival (1967) and in the Woodstock Festival (1969) introduced many more Westerners to Hindustani instrumental music. These noted musicians, along with Ali Akbar Khan performed at The Concert for Bangladesh (1971), which was initiated by George Harrison to raise funds for UNESCO’s humanitarian programs in Bangladesh. Yehudi Menuhin also performed with Ravi Shankar and Alla Rakha at the UN’s Human Rights Day concert. After that, there were almost yearly concerts by the big players. While Carnatic music did not get much exposure in those days, M.S. Subbulakshmi performed in 1966 at the UN and at Carnegie Hall, followed by a concert tour. Ali Akbar Khan opened a school in San Francisco bearing his name in 1967, and this school over the years, has taught Hindustani classical music to thousands of students. It became the fountainhead for cultural activity with faculty members like Zakir Hussain and Chitresh Das. Carnatic vocal music made a mark in the United States through the pioneering work of Professor Jon B. Higgins of Wesleyan University, who had studied this discipline in Chennai through a Fulbright scholarship, and was known in South India as Higgins Bhagavatar. He established a program in Carnatic music at Wesleyan, which is probably among the earliest university based program in Carnatic music in the United States. 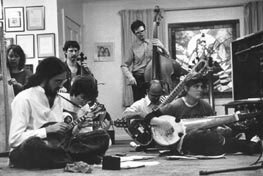 In the early 1960’s some faculty members from American universities visited India to learn classical music and later became part of ethnomusicology or world music programs on several American campuses. The 1985 Festival of India, with its vibrant concerts of music and dance, further increased the visibility of the Indian performing arts. It was, however, the changes in immigration law that brought in waves of Indian professionals in the 60’s, a whole new future audience. As they established themselves financially and professionally, many of them raised funds to build scores of temples across the United States. As the years have passed, NRIs have also invested in establishing chairs in universities and patronizing the arts. “I don’t have a single friend who’s not interested in listening to music or taking it up himself,” he says. “The majority have realized their ambition in their medical profession and so have more time now to devote to their hobby. I cherish it and enjoy music very much.” His wife, an internist, is also studying the harmonium and voice at a school that has opened just across the street. Indian music, dance and yoga are now sprouting up in suburbia, in strip malls and private homes, next to ubiquitous pizza joints and nail salons! Classical dance and music are no longer elitist, but within the grasp of middle income Indians. They do not all boast the reputation of Ali Akbar Khan’s school to be sure, for they come in all sizes and varying expertise. Yet as the Indian American population has grown, there are huge cultural festivals in places like Phoenix, Ariz., supported by the Indian community, where thousands turn out to watch performances of Indian dance and music. For people who want to expose their children to Indian culture on a systematic basis there are definitely more choices available today than there were 20 years ago. Raja’s Young Indians Culture Group, a not for profit organization, started with just 30 children and has grown to over 150 children, who are taught classical and folk dance, music, languages, yoga and Vedic traditions by a dedicated faculty. The classes are held at the Herricks Middle School, thus becoming part and parcel of the mainstream and a community resource. Raja points out that credit has also to be given to the Indo-Guyanese community, which does a lot to keep Hindu culture flourishing through classes, programs and concerts. The Indian American community, though, needs to pick up on the momentum and be more aware in building for the future, like the Jewish community. The Indian community, while building many temples, has generally not been into institution building. Hinduism, being so elastic and expansive, has less structure and there are no schools for Hindu culture. Now some of the nearly 160 Hindu temples in the United States, such as the Hindu Temple Society of North America in New York, the Venkateshwara Temple in Pittsburgh, or the Meenakshi Temple in Texas, have started outreach, and have incorporated bharatanatyam, sitar and tabla classes along with yoga, Vedic traditions and language for their congregations. But the temples are still scattered and far-flung, and what Raja would like to see is a community center model, a gathering place available to all members of the family to practice whatever interests them, from dance to music to meditation, a space where everyone from children to seniors can be in touch with their culture. According to Dixit, the South Indian community has been particularly strong in keeping the Carnatic music and South Indian performing arts flourishing: “They are doing a wonderful job. Music and dance is part of the family tradition in South India; every daughter and son learns it right from childhood. Many young South Indians are adept at Carnatic music and can accompany even professional musicians on the mridangam, the ghatam or the violin. You have lawyers who can play the mridangam professionally and you have practicing surgeons who’ve been through their arangetrams. For them, the arts are a part of life, something that makes them complete. But now just might be the time and America just might be the place. Even the mainstream is enamored of everything Indian and an intriguing array of Indian dance, music, fashion and culture is now seeping into the mainstream. Bharatnatyam in jeans, even if difficult for the mind to embrace, may be possible in spirit, where traditional arts and modernity, ancient languages and pop talk, commitment to the old and new can all be in the psyche of one person. After all, isn’t that how you would describe an Indian?